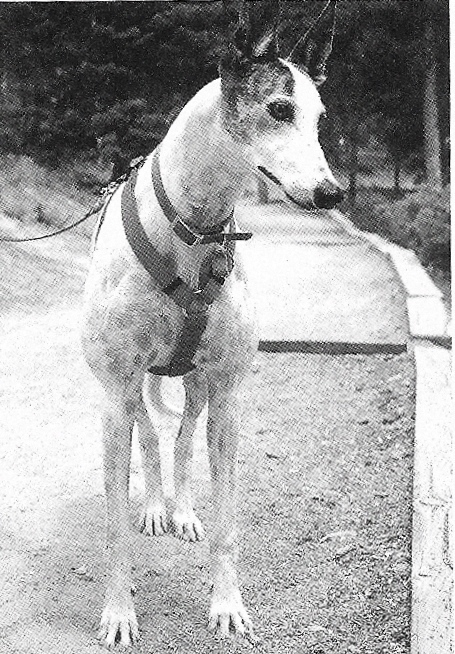 In June 1995, we adopted our second Greyhound, Tasha. She was similar to Cody in the barking department, but she barks at cats and squirrels, too. Tasha maintained her fairly mellow attitude to strangers and visitors until the first week of school one year. That day my daughter and I came home from work and school about 2:00 p.m. and found someone had been in the house. Tasha and Cody were crated that day. When we let Tasha out of her crate, she immediately ran to the basement, where we later discovered someone had broken the street-side basement window and entered our house. I had to hold Tasha back when the police officer came to take our report; she was not going to allow an additional stranger into our house. Since then, we always let Tasha have run of the house. I found out how well she protects my house when a friend dropped by one day when we weren’t home. When my friend rang the doorbell, Tasha ran to the front door barking, jumping, and slamming her feet against the door. Tasha stayed put — feet on the door, looking out the window, barking with hair bristling. My Greyhound-savvy friend told me when Tasha hit the front door it was frightening how ferocious she looked. So my Tasha is a watchdog who protects my house, thus breaking another stereotype about Greyhounds. This protection is wonderful, especially since my husband often works late or is out of town on business. Tasha has gone on to prove that she isn’t just protecting our property. She watches out for us, as well. One summer we hired two men to build a deck on the back of our house. Tom had been the first grade teacher for both of my children and his friend, Jay, was a kindergarten teacher. These men are people we trust. The dogs both love Tom; he is an animal lover through and through. Jay is very nice, but for some reason Tasha just doesn’t like him. One afternoon, while Becky was playing Nintendo, Jay came in the house and talked to Becky before using the facilities. While Jay was talking to Becky, Tasha got up and stood between Jay and Becky, with her hackles raised. Tasha continued to stand between Becky and Jay until he left the house. Although Tasha never harmed Jay, she let him know if he wanted to do anything to Becky, he would have to get past her. We love Tasha’s protective spirit, but there is a price to be paid. We discovered this when the UPS driver left a package and rang the doorbell. In her haste to protect her territory, she punctured Cody’s neck because he was between her real target — the UPS man. Since then, we never leave Tasha loose with either Cody or our whippet, Dundee, when we aren’t home to referee. Who needs an alarm system when you have a wonderful, loving girl like this?